In this chapter, published geochemical data for soils from several Pb–Zn mine sites and districts from Spain are reviewed. Although most of the mines have closed down, a legacy of highly polluted soils still remains throughout the sites constituting a potential hazard for the environment and human health. The fate of the studied metals and metalloids in these soils is mainly controlled by factors such as mining methods, concentration and metallurgical operations, mineralogy of the ore, gangue and host rock, fracturing of the host rocks, physiography, climate, and soil types (pedogenic evolution). 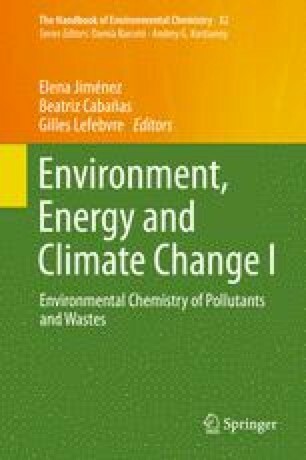 It can be concluded that the most polluted soils (identified on the basis of an enrichment factor) are those of the Sierra Minera (La Unión District – SE Spain), at more than 488 (Pb), 163 (Zn), 99 (Cd), and 98 (As) times the background values from non-contaminated soils. Pb is usually related to As, which in turn is bound to Fe oxides and oxyhydroxides. Metal bearing jarosite and other soluble phases also play a relevant role in the studied soil–water systems, because these minerals are dissolved during intense rainy events, thus resulting in high rates of metal leaching and mobilization by runoff. The study presented in this chapter was partly funded by the Spanish Ministry of Economy and Competitiveness (Project CTM2012-33918). USEPA (2013). Drinking water contaminants. Water, United States Environmental Protection Agency. http://water.epa.gov/drink/contaminants/index.cfm. Accessed 10 Feb 2014.